Baton Rouge, LA – March 24, 2015 – When the NCAA Men’s Basketball tournament tipped off Tuesday night, commuters didn’t miss the action. 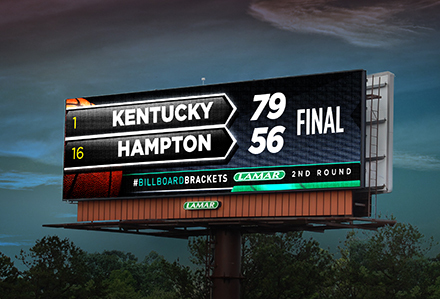 Made possible by technology developed in-house, Lamar Advertising Company (Nasdaq: LAMR) began its #BillboardBrackets campaign by displaying live scores on its network of digital displays. After a successful trial run during the Dayton, Ohio first round games to finalize the brackets, the hyper-local campaign will roll out for the remainder of the tournament. As the teams battle, live scores are updated on Lamar’s digital billboards in the teams’ home markets and the market hosting the game. The opening game, between the Manhattan College Jaspers and the Hampton University Pirates, featured scores updated in real time in the host market of Dayton, OH, as well as in New York, NY and Richmond, VA, the markets local to the two teams. As the tournament progresses, the 68 teams’ local markets will be eliminated from the live score updates as their teams exit the tournament. As teams get eliminated, the billboards mimic the concept of the brackets decreasing and markets with live scores "drop off" accordingly. Live scores are displayed on Lamar’s digital billboards in the teams’ home markets and the market hosting the game. 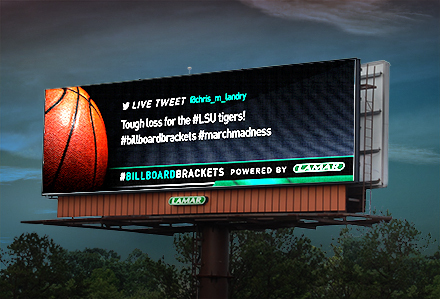 Between games, live tweets with the hashtag #BillboardBrackets are displayed on Lamar’s digital billboards. In order to maintain the momentum of the campaign between games, Lamar added a social media component with the dedicated hashtag #BillboardBrackets. Live tweets containing the hashtag will be streamed to the digital billboards. 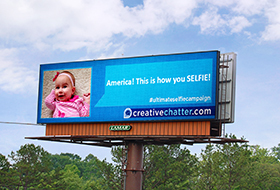 Webcam shots from the digital billboards will be posted in a #BillboardBrackets photo album on the Lamar Advertising Company Facebook page, so people can see their tweets running on the billboards. Lamar is taking the opportunity afforded by March Madness to showcase its ever-expanding digital capabilities. The campaign started on March 17 and will run through the Championship Game on April 6.